BHASVIC BTEC Music students performed an acoustic version of their 67 years of Music concert with some Christmas classics at the Royal Alex hospital on Wednesday 13 December. BHASVIC’s fundraising event in aid of the Royal Alex Children’s Hospital (BSUH Charity) has raised £135 so far – which will be going towards creating more patient friendly environments; provide equipment for diagnosis and treatment; and support staff development to provide even better care. BHASVIC’s BTEC Music and Business students also held an evening concert entitled 67 years of Music on Monday 11 December, featuring various genres of music from the early days of rock ‘n’ roll, synth pop, R&B and punk. 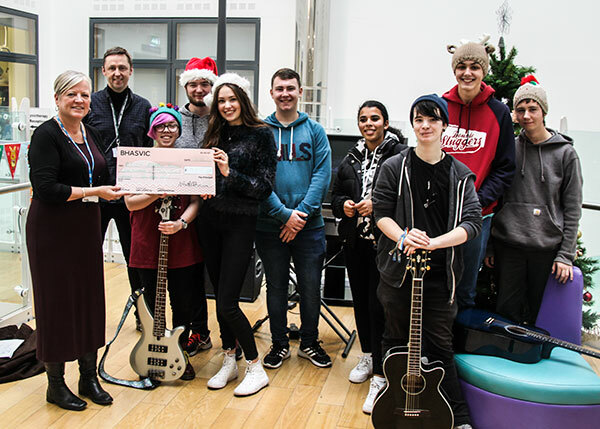 Photo: Cheque presentation by BHASVIC BTEC Music and Business students to Sarah Tasker, the Director of the BSUH Charity.